*Excludes Bezwecken, Douglas Labs, Genestra, Health Concerns, Klaire Labs, Metagenics, Pacific Biologic, Pharmax, Pure Encapsulations, Sedona Labs, Seven Forests, Thorne Research, and Unda brand products. Can't find a specific product? We carry many more products not listed on our site, so contact us at 877.851.2813 or use our e-mail form for any product requests you may have. All special product request and refrigerated probiotic orders are final. 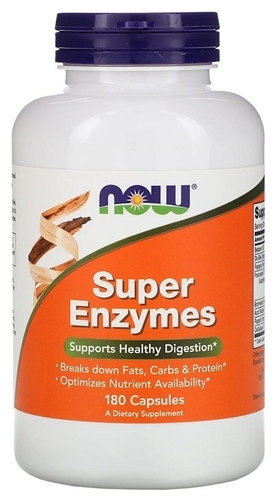 Super Enzymes by NOW is a comprehensive blend of enzymes that supports healthy digestion. Formulated with Bromelain, Ox Bile, Pancreatin and Papain, Super Enzymes helps to optimize the breakdown of fats, carbohydrates and protein. Other Ingredients: gelatin (capsule), cellulose, magnesium stearate (vegetable source), and silica. Not manufactured with wheat, gluten, soy, milk, egg, fish, shellfish or tree nut ingredients. Produced in a GMP facility that processes other ingredients containing these allergens. Adults take 1 tablet with food or as directed by your healthcare practitioner. Consult your healthcare practitioner prior to using this product if you are pregnant, nursing, taking medication (especially blood thinners) or have a medical condition including allergy to papaya or pineapple.